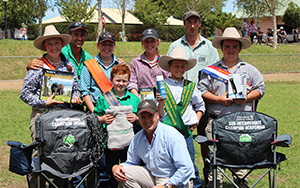 Fantastic result for yesterday’s Spring On Property Bull Sale. Thank you to all our buyers and under bidders. Congratulations to Holstons pastoral Co, who secured the top price bull, Lot 3 Irelands Neptune N12 for $32,000. Corey pictured with Peter August (Holstons Principal) and managers Andrew and Lisa. Sale average was $6298, selling 35/41. Thank you to all our buyers and under bidders at yesterdays, Autumn On Property Bull Sale. Repeat client purchases were strong with bulls averaging $5081, proving great value for money. Congratulations to long term clients of 7 years, John and Nola Ross of Omeo Station, Benambra VIC, notching up their 41st bull purchase with lot 16 Irelands Musician M417 to top the sale at $10,000. One of the first S A V Resource sons to be offered for sale, M417 is a complete outcross to anything in Australia. Pictured below with John, Corey and Charlie. The highlight for us was the strength and loyalty of many return clients who have benefited from the Irelands program. *Sign up below to go on our mailing list to receive a catalogue. Sign up here to receive our yearly newsletter and pre-sale flyers. Fill in this form to receive our yearly emails and pre-sale flyers!